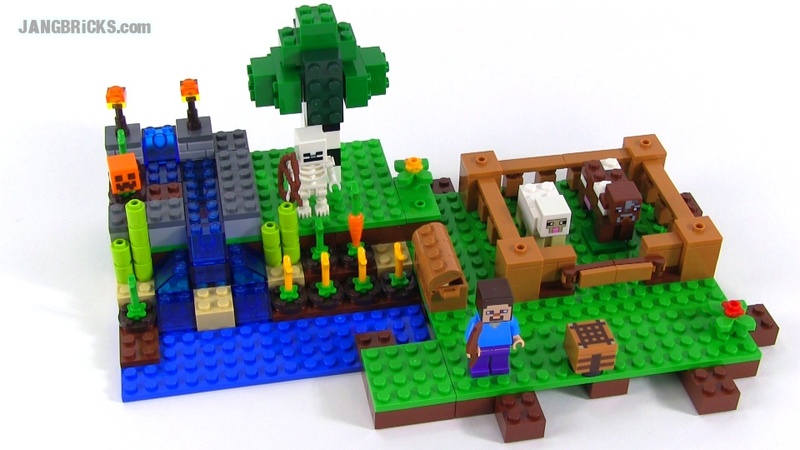 Here's the second smallest of the first wave of minifig-scale LEGO Minecraft sets. It features three mobs, a Steve, and a bunch of stuff that I view as great add-ons to other scenes. Nurture vital crops and supplies at The Farm! Yield renewable resources with The Farm! You’ll need food to survive, so fence in the livestock and channel the flowing water to nurture the crops. Harvest pumpkins, wheat, sugar cane and carrots. Use the crafting table to create a pumpkin helmet or jack-o'-lantern. But watch out for the skeleton with his bow and arrow after nightfall! Rebuild the set for more LEGO® Minecraft™ creations or combine with 21115 The First Night and other sets in the series for an even bigger Minecraft adventure! Watch out for the evil skeleton! Combine with 21115 The First Night and other sets in the series for an even bigger LEGO® Minecraft™ adventure!